Rich, dark chocolate truffles accompanied by Champagne say romance better than anything! We think this recipe developed by cookbook author and Chef Holly Herrick using Spicy Slatherin’ Sauce combines the perfect zing to snap your love’s heartstrings. To prepare the ganache, combine the semi-sweet and dark chocolates in a medium bowl. Separately, heat the cream in a small skillet over medium high heat until just simmering. Pour the cream over the chocolate. Stir with a wooden spoon or spatula to combine completely. Once combined, stir in the salt, chipotle, and Slather Brand Slatherin’ Sauce Spicy Recipe until incorporated. Cover with plastic wrap and refrigerate until completely set, at least five hours or overnight. 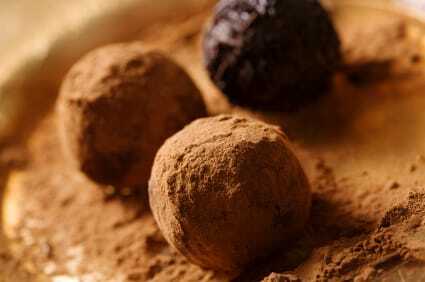 To finish the truffles, sift together the cocoa powder and chipotle chile pepper in a small bowl. Using a teaspoon, dip into the set chocolate ganache and level off the teaspoon. Scoop the chocolate out and roll, between palms, to form small little balls of chocolate. Roll each of these in the cocoa powder and chipotle mixture until completely coated on all sides. Arrange in a single layer and repeat until the ganache is gone. Count on approximately 40 delicious truffles. Refrigerate, covered with plastic, until ready to serve. They will store for several days and up to one week in the refrigerator.